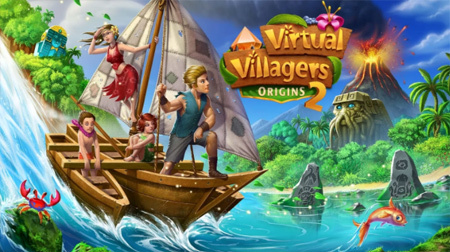 Virtual Villagers Origins 2 is a unique simulation game by Last Day of Work, LLC. The game will take you to the famed and mystical island of Isola. As the boat lands on the beach, you are greeted by a strange man and begin to explore this mysterious new world. Breed, heal and care for your beloved village children and families. Train villagers to become proficient at various skills to perform tasks around the island and survive their new-found world. The game features beautiful graphics and cool sound effects. The beautiful and curious island of Isola was once a paradise home to a thriving civilization. If you need some help, check out the video walkthrough and gameplay for the game. This entry was posted in Android Games, iOS Games, Mobile Games, Walkthrough and tagged Virtual Villagers Origins 2 Cheats, Virtual Villagers Origins 2 Crafting, Virtual Villagers Origins 2 Gameplay, Virtual Villagers Origins 2 Guide, Virtual Villagers Origins 2 Help, Virtual Villagers Origins 2 Hints, Virtual Villagers Origins 2 Puzzles, Virtual Villagers Origins 2 Review, Virtual Villagers Origins 2 Rope, Virtual Villagers Origins 2 Solutions, Virtual Villagers Origins 2 Strategy, Virtual Villagers Origins 2 Tips, Virtual Villagers Origins 2 Walkthrough by Marvin. Bookmark the permalink.